Over the last 10-20 years, tallow has been crucified by the food and health industry as an unhealthy fat ~ something that should not be messed with simply because it is perceived to lead to health issues, or is looked down upon since it is an animal fat. The truth is that tallow from grass fed cattle is actually wonderful to cook with and also even better to rub on your skin. Tallow is rendered fat (suet) that surrounds the kidneys/organs of a cow, deer or bear. Once a cow is butchered, the tallow separates from the tissues (muscles/ligaments, etc) and turns into a colored oil. It’s then sifted/strained through a fine filter to remove impurities, and cooled. Tallow was highly popular long before supermarkets became a source of regular weekly shopping trips, as families used what they had available in their homes for making personal care items like bar soap, candles and skin creams/salves. Tallow was used for cooking and was a kitchen favorite because it had such a high smoke point (400 degrees F) and lasted for quite a long time once rendered. Grain-Fed vs Grass-Fed: Is All Tallow the Same? Though it’s incredibly easy to source, and even more versatile to use, not all tallow should be considered the same. Tallow rendered from grass-fed beef is a better option for those looking to take advantage of its benefits. Compared to grain-fed, factory farmed cows, tallow rendered from grass-fed beef is always a better option. Conventionally-farmed cows are fed an unnatural diet of GMO corn and kept in confined areas with no access to pasture or regular, daily sun. Many toxins are stored in grain-fed animal fat, which, in turn, can end up in your food or skin care products – yuck and gross! If you are purchasing tallow for cooking or skin care, it’s best to look for sustainable sources – a local farm that raises grass-fed, pastured beef cattle (grass-fed and grass-finished) is better than using any tallow, especially tallow from a source that is questionable. Grass-fed beef is a significantly better option – cows that graze on pasture reap higher levels of vitamin A, D, E and K because of the sunshine that they are exposed to through the day. Just like the human body stores valuable nutrients in our fat to use later on much like cows store a wealth of benefits in the fat (suet). For this reason, it’s a better option to choose tallow from grass-fed, pastured cows that are given ample space to move around and simply be a cow, graze on pasture and just enjoy life. Tallow closely resembles the human skin cell structure because both human skin and tallow contain 50-55% saturated fats, which help provide skin cell integrity. Tallow and Sebum (which is the oil we have naturally in our skin) both contain primarily triglycerides, which allow nutrients to be absorbed quite easily. I love using tallow to make tallow balm for the skin, as well as cold process soap – used in soap making it makes a wonderfully hard, but very nourishing bar that lathers beautifully. 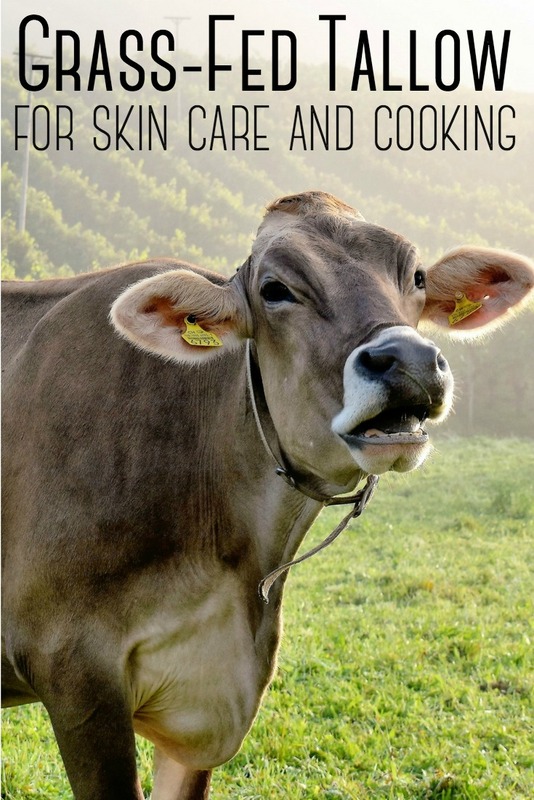 Share the post "The Benefits of Grass Fed Tallow for Skin Care and Cooking"